Why are so many vegetarian cookbook authors bashful or apologetic about salads? Not me! I’m proud of my salads: I love serving them to others, and I enjoy eating them myself. Done right, salads are interesting, delicious, and nutritious. What’s to be afraid of? 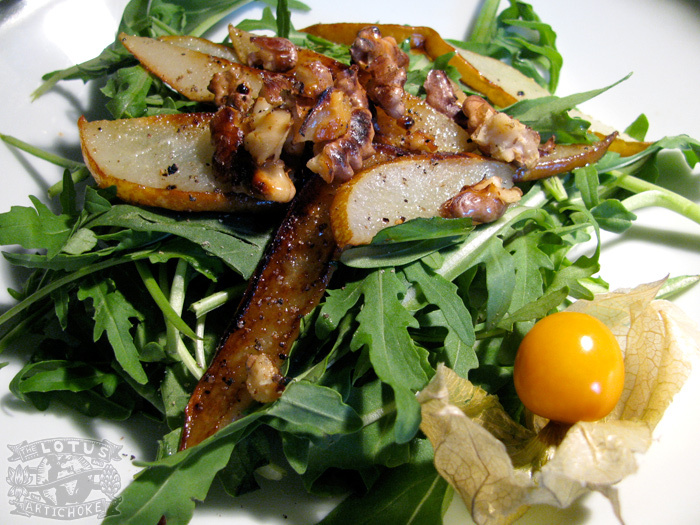 This is – no apologies – one of my classic favorites: Arugula Pear Walnut Salad. I’ve been making this salad for so long it’s hard to say where the idea originally came from. I believe it just evolved over the years through experiments, dozens of dinner parties, light lunches, and the simple need for a great meal opener for any season. Sure, some people don’t like salads. But who doesn’t like pears and walnuts? Sneak some crunchy, baby arugula under there, splash some quick lemon balsamic dressing on top… you got a keeper. Just in case I need to tell you this: like with most raw or almost raw dishes, the taste and flavor are greatly determined by the quality of your ingredients. Go for good, organic baby arugula when possible. Find a nice, moderately ripe pear. Crack shelled walnuts for the freshest flavor. You get the idea already. Sort, wash, dry arugula. Arrange on serving plates, set aside. Heat oil in small frying pan on medium high. Add pear slices, sprinkle with pepper, salt. Sear until browned and soft, about 2-3 min each side, shifting in pan regularly. Remove pear slices, cool on separate plate. Add walnut pieces, pepper, salt to pan. Begin to roast on medium high, stirring constantly, about 1 min. Turn off heat, move walnuts to plate with pears to cool. After pears and walnuts have cooled, arrange on arugula greens. Whisk all ingredients in a glass or bowl. Garnish with sprouts or a sprig of fresh parsley or basil. Dress salad and serve, or serve with dressing on side. Lemon juice can be replaced with +1 tspn balsamic or rice vinegar. Instead of agave / sugar, try 1/2 tspn raspberry or strawberry jam. Granny Smith or other crisp apples work in place of pears. Sunflower seeds, pecans or other nuts can be used in place of walnuts. This entry was posted in Salads and tagged almost raw, arugula, balsamic, lemon, recipe, salad, vegan, walnut. Bookmark the permalink.